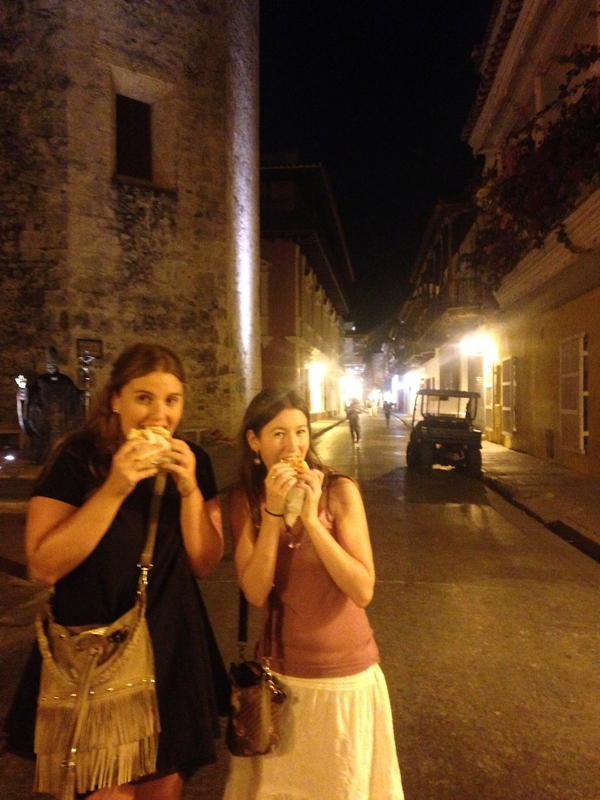 Bob is in Cartagena! I have to say, we were not immediately impressed. 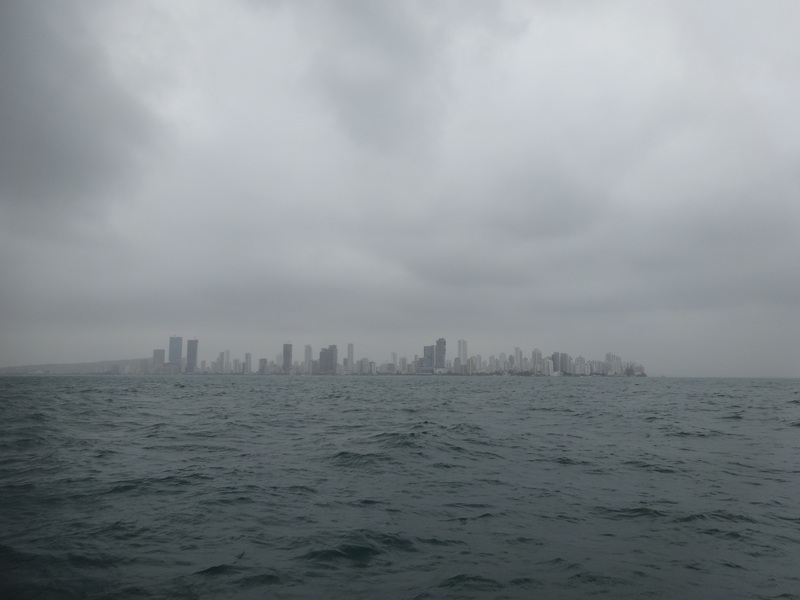 After a long night of large waves, Cartagena emerged out of the hazy gloom at 8am, February 17th. First the water turned a muddy brown colour and then the distinctive silhouettes of sky scrapers materialised. Not what we were expecting! The approach to Cartagena was rough but not too-much-so. The wind was moderate – about 20 to 25 knots with gusts up to 30 or 35. Waves were about 3.5 meters (10 feet) on average but not steep enough to be too much of a problem………… with one exception. At about 4am we were down below and heard the ominous sound of a wave larger than any we had thus far encountered breaking and bearing down on us. When it hit, it did so with a resounding crash and Bob was heeled over abruptly 60 or 70 degrees. Stuff went flying everywhere. Isabelle was sleeping at the time and had the unfortunate experience of having the entire contents of the book shelf deposited onto her bunk on top of her. Pots and pans in the galley cupboards could be heard crashing into the cabinet doors, and somehow the portable generator (which had been wedged in very tightly among a load of other stuff) ended up upside-down and leaking petrol onto the fridge. No real harm done though – we righted the generator, wedged it in again, put the books back and added an extra piece of string to keep them in place should we experience another such wave. Fortunately, we didn’t. There was a strong current against us – 2 to 3 knots I’d say. Even with Bob well powered-up we were only making 4 knots ‘SOG’ (speed over ground). A large number of ships were using this current to their advantage as they steamed North on their way, presumably, from the Panama Canal. These typically approached from ahead of us doing 16 to 20 knots, sometimes more. Added to our 4, that meant a very rapid closing speed and little time to make them aware of our presence and adjust course to avoid us. To compound the issue, visibility was down to 4 or 5 miles at best. It was a busy night. The closest call came not from a ship but from a fellow sailing vessel. Like us, they didn’t have an AIS transponder which meant they could only be detected visually (since we don’t have radar). The poor visibility (if anyone knows the reason for this I’d love to hear it – I’m guessing it is dust in the atmosphere from the desert to the East of us?) meant that i didn’t spot his tri-colour navigation light until he was about 2 miles from us and it was apparent fairly quickly that it was going to be a close call as his compass bearing from us was unwavering. I estimated his position and tried raising him on the radio twice but received no response. He passed about 100 yards astern of us on a course perpendicular to ours, and presumably remains oblivious to this day how near he came to meeting us on very close terms indeed! Having arrived in Cartagena Isabelle and I anchored Bob in 4 fathoms, made everthing ship-shape and went ashore. Sarah was waiting on the dock. Needless to say that made me very, very happy indeed. Cartagena is not as it first appeared. The old town, from the little we have seen of it so far, is beautiful. The prices are very, very reasonable, the seafood is fantastic and the bread is possibly the best I have ever had (sorry France, Colombia has it!). I had the ‘opportunity’ to walk through some less-touristy areas today when I got lost on my way back from the immigration office and that was quite educational. Tomorrow I think we’ll head to the old town again; I’d like to visit the ‘Museum of the Spanish Inquisition’ and then I suspect Sarah will drag me to a beach that is supposed to be incredible. I’ve been grossly spoiled by Bermudian beaches and don’t therefore have much time for them in other places as they are invariably inferiour. I suppose I could probably endure it if forced. Isabelle is still on board with us so we are currently three. She’s itching to get back to the Eastern Caribbean. Unfortunately, doing so by sailboat is tricky at the moment on account of the strength of the trade winds so she may have to get on one of those unnatural metal flying things. It’s been really wonderful having her on board – she’s saved me from myself on many occasions, has been fantastic company and always eager to help with everything. Sarah and I will set sail from here soon – perhaps Tuesday next week – and stop in the San Blas Islands briefly before heading in to Colon, Panama, to arrange our canal transit. We’re hoping we can arrange a transit date and then double back to San Blas for a week or so to wait for our slot there instead of staying in Colon. I’ve been to Colon before, briefly, in 2002 with the Picton Castle. By all accounts it is a very appropriately-named city – the arse of the world, and I have no desire to stay there any longer than is absolutely necessary to arrange the transit. View looking Astern about 2 days out from St. Martin. Sailing under genoa alone. The red thing is the wind vane, which performed absolutely superbly throughout – better than any other model i have ever had experience with. 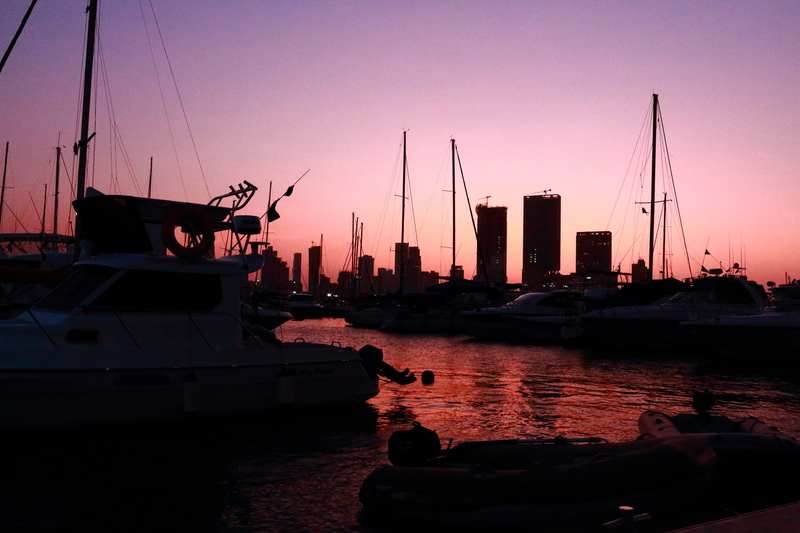 Our first view of Cartagena………. Well I arrived in Cartagena with no issues at all. I said goodbye to my family in Bradford and my dad dropped me off at Brighouse station where I caught a train to London. I met up with my lovely friend Laura and her boyfriend, Ewan, in Kings Cross which was a wonderful last-minute surprise, not only to have a friendly face to see me off before heading to Heathrow, but also because I had someone to help me with my bags (thanks Ewan). It’s not easy packing the next 3 years of your life into a small space whilst trying to make it as light as possible. Right now it’s the morning of the 17th February and Alex is due to arrive in Cartagena any time now. I’m just sat on my bed in the hostel writing this post before heading out to grab some breakfast and then seeing if I can find the marina where Alex will be arriving, I can’t wait to see him. 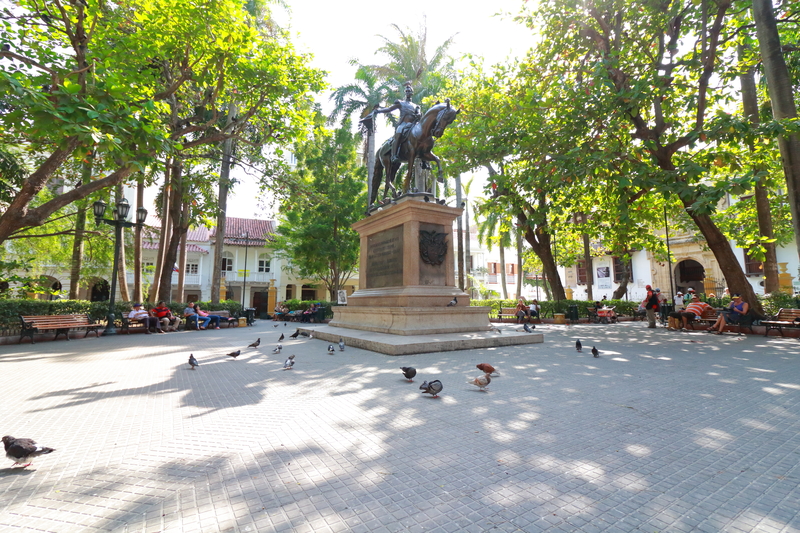 Cartagena is a wonderful bustling city, full of colourful buildings, friendly locals and a historic Spanish colonial feel, at least in the Old Town. Other parts of the city appear to be very modern with lots of high rise buildings, shopping malls and sky scrapers. The hostel I’m staying in is small but perfectly formed and seems very reasonable for the price. I’m ashamed to say that this is my first time ever staying in a youth hostel, but I thought at the ripe young age of 31 I would give it a go. It’s proved to be a fantastic place to meet new and interesting people and I’ve already made some fabulous friends. I was here for less than 5 minutes before I was invited to join a couple of girls on a free walking tour of the city, which of course I accepted. 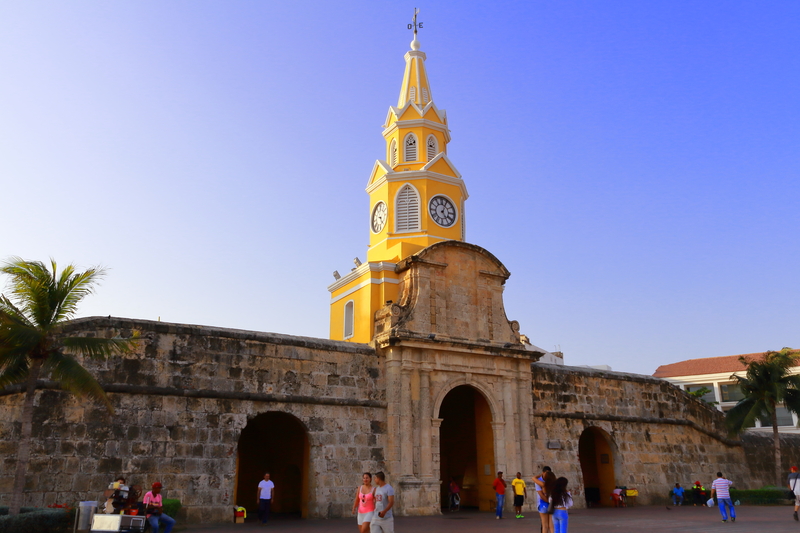 Cartagena is one of the oldest settlements in Colombia and has some beautiful buildings with some very interesting history. The tour was run by a local guy called Edger and because the tour is free, he relies heavily on tips to make an income – so he’s got to be good. After the tour, we got some lunch and then had an afternoon trip to a small beach on the edge of the city. The beach isn’t exactly the tropical paradise you might imagine when you think of the picturesque images of beaches often associated with South America. Instead the sand is quite dark and grey (a bit like the sand you might find in Blackpool), the sea is therefore a bit of a muggy colour and there are a lot of locals trying to sell you things every 5 minutes. Still, the weather has been glorious and the sea is nice and warm to swim in. I’ve been told about a lovely beach called Playa Blanca which is a 2 hour journey from Cartagena and is supposed to be beautiful white sandy beaches, turquoise waters with restaurants serving freshly caught fish dishes. I thought I would wait for Alex to arrive before visiting there. After the beach, we all went out for a lovely dinner where I had sea bass civiche for 20,000 pesos – this might sound extortionate, but it’s actually less than £4.50. I love checking my bank balance at the ATMs in this country, I can pretend that I’m a millionaire! 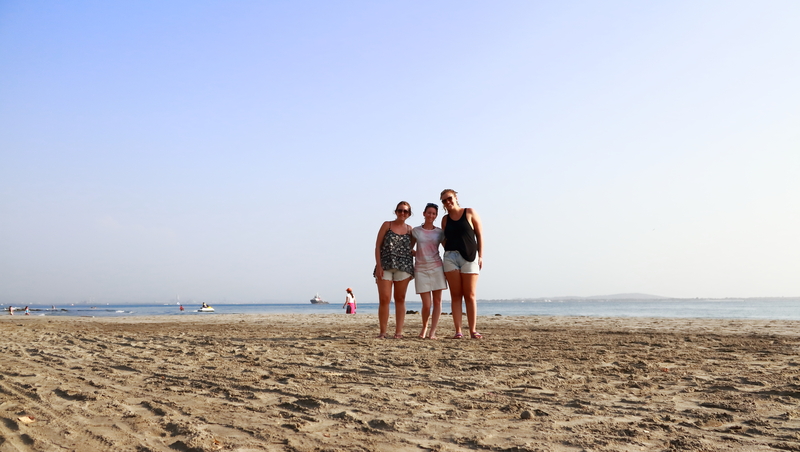 Yesterday morning I met two lovely Argentinean ladies at breakfast who invited me along to another beach in a different part of the city, a place called Castillo Grande. This was a much nicer beach, the sand was a similar colour but it was much beach itself was much bigger, there were fewer tourists and less people hassling us to buy stuff. If you find yourself in Cartagena looking for a good beach that is within a 10 minute drive, the ones at Castillo Grande are the place to go. Having spent months and months in the grey, wet, cold climate of Yorkshire, I was more than happy to spend another day at the beach. The girls introduced me to a local Argentinean drink called terere; it’s made from a herb called yerba which is mixed with fruit juice and drank cold. It’s a lovely refreshing drink which tastes a little bit like green tea which I thought my mum would really like, absolutely perfect to have whilst lying on the beach soaking up the sun. I’ve also tried ‘arepa’ which is a local Colombian dish made from cornmeal dough and stuffed with cheese and meat, then deep fried to a tender, flaky perfection. It’s often served as street food, so really handy when you’re feeling a bit peckish walking around the town. Anyway, it’s getting close to 9.30am and I’m keen to finish packing, have breakfast then find Alex. We’ll check in with you again soon. Thus far Bob has had a lovely time of it. 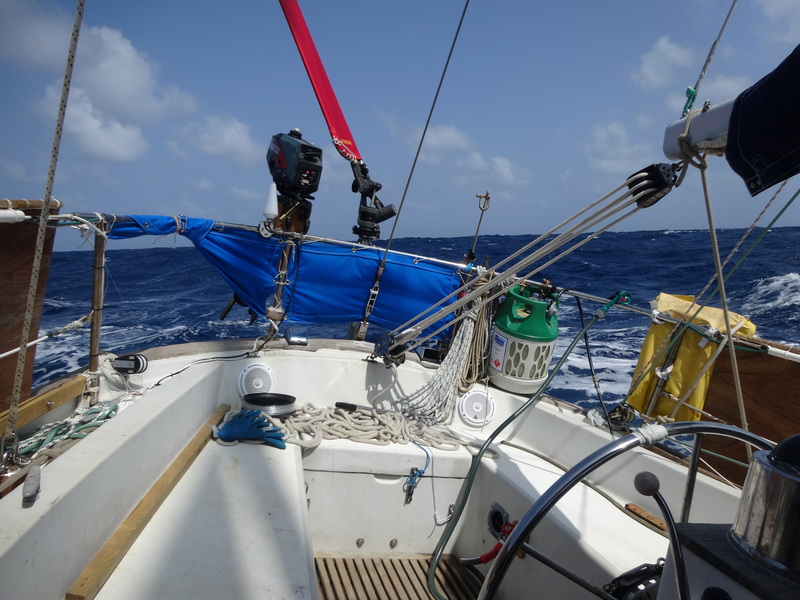 With the exception of day two, when winds were very light and we were forced to head straight South towards Venezuela, we’re enjoyed very favourable winds and kind seas. At least, I say they’re kind and Isabelle believes me, but in her book they’re pretty big! Bob is running along under poled-out genoa and currently averaging a touch over 6 knots. Winds are 20 knots from the East and promise to remain about the same (15 to 25) for the next couple of days at least. We could be doing 7 knots but alas, the only size of aluminium tubing that the metalworking place in St. Martin didn’t have in stock was the size I needed, so my spinnaker pole is looking very sad and bent where it had an unfortunate encounter with the shrouds back in 2009. Until I figure out a permanent solution (hopefully in Cartagena) it’s managing remarkably well under the circumstances, though I expect at any moment to hear a bang and a crash and go up on deck to see one end dangling from the genoa sheet and the other lying on the lifelines with one end still attached to the mast. Fingers crossed it won’t be necessary to clean up that mess! Other maintenance – we had been using the brand-new 110% working jib but it was getting beaten up by the light winds and the boat rolling back and forth, alternately filling and then backing it. I decided to switch it out for the big old rotten genoa. Unfortunately some of the stitching didn’t like the brief flogging it received when we were shortening sail before a squall yesterday. It’ll have to come down and be replaced with another old, beaten-up one at some point – no small task in 20 knots of breeze, and it only promises to build from here. A job for after lunch methinks. We’ve been working hard to empty the fridge to make way for potential fish. Last night (after another hearty beef stew) I declared that our efforts have been sufficient, so this morning I have put out a fishing line for the first time on this voyage. Thus far the only catch has been Sargassum Weed, but I have faith. A mahi mahi would be very very nice indeed. There’s not a whole lot more to report really. I’m still pretty nervous about rounding the headland on approach to Cartagena but I’m not worried that it will endanger Bob even if it’s really nasty. At around the time I send this I’ll also attempt to extract a weather forecast from the ether, and at that point I can get a good idea of whether we should go for it, slow down and wait for a window or, if it looks really nasty, pull in to Santa Marta and wait it out. Hope all’s well with everyone! Bob is finally on the move. 2 weeks has turned into 7……..ish and St. Maarten has been invaluable as a resource of both bits of boat and excellent company. The time has come to leave, however, and not a moment too soon! I am very much looking forward to Sarah joining me in Cartagena; in fact, she flies into these in a mere 6 days but I fear I will not be there to meet her as my departure has been delayed by one thing after another, most notably the weather. The passage from St. Martin to Cartagena should be mostly an easy one. Between 15 and 25 knots of breeze from astern or on the quarter makes for a very happy Bob and a very happy crew. I say ‘mostly’ because there is one rather large (though hopefully short-lived) bit that promises to be anything but easy. The approach to Cartagena itself is notoriously horrendous. There is a mountain range near a town called ‘Barranquila’ (a notorious drug-smuggling port) and to the East of the range is a large desert. These topographical features produce a diurnal low pressure which, in periods of strong trade winds (like now………) produce winds of 30 to 40 knots and very large seas. Exacerbating the situation is a current which runs North East up the coast of Colombia, opposing these strong winds and making the waves very steep. Further adding to this is the effect of the South American continental plate, which cause the sea to shallow and makes everything even worse, plus a large river which flows into the Caribbean Sea at this point and mixes things up even more! I’ve spent the last 3 days looking at the long-range forecast and trying to figure out when the trade winds might abate and make life easier. Unfortunately, they still show no signs of doing so we’re just going to have to bite the bullet, head to sea and hope the forecast changes. On the plus side, unlike North Atlantic weather systems these conditions off the Colombian coast are very predictable and localised. 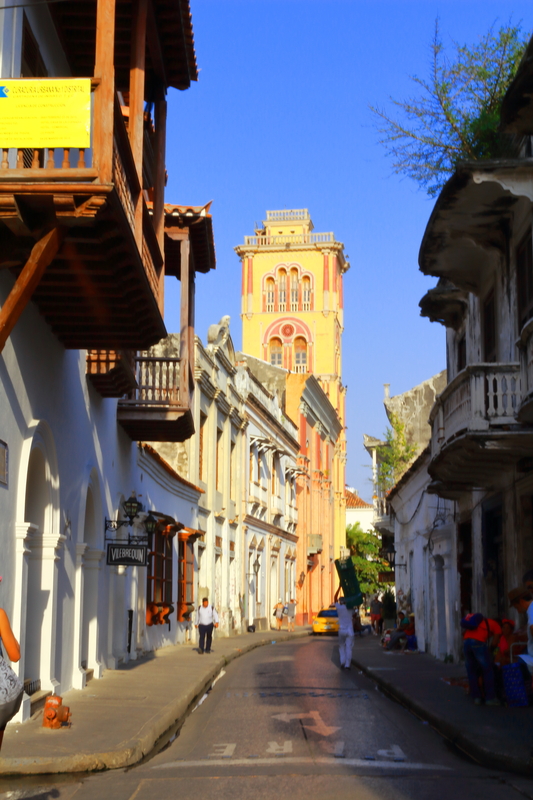 There is also a bail-out option – a town about 150 miles East along the coast from Cartagena called ‘Santa Marta’. This is another hot-spot for cruisers, many of whom work their way along the Venezuelan coast, through the ‘ABCs’ (Aruba, Bonaire and Curacao) and then wait in Santa Marta for a good window in which to make that last hop to Cartagena along the coast. Alas, we don’t have the option of taking our time at the moment – we need to be getting through the Panama Canal by mid-March at the latest. Also on the plus side – I have found an excellent crew member for this leg of the Voyage – Isabelle from Sweden – who has absolutely no time restraints whatsoever and who has so far proven to be excellent company and a very willing helping hand over these last few days leading up to our departure. She also likes cheesy pop music so I think we’ll get along fine. We’re provisioned, full of fuel, water and lots and lots of stuff and I have cleared out French customs and immigration (while sitting in a marine chandlery drinking a beer – these French really are very civilised). I don’t like leaving port to go to sea in the evening so we’re going to get a couple of odd jobs done, have a beer, pull the dinghy out of the water, lash it on deck and be ready to catch the first bridge opening tomorrow morning at 0830. I’ve arranged an agent for entry into Colombia in Cartagena – a very characterful German gentleman who has requested that I bring him some Gouda, sour-pickled herring fillets and some kind of sweet liquorice. His most valuable advice was to ‘stock up on cheese and wine as they are very expensive here’. Alas I could only manage to carry 7 bottles (purchased for an average of $3.50 each) in addition to the rest of the groceries. Ah well, I’m sure we’ll manage.